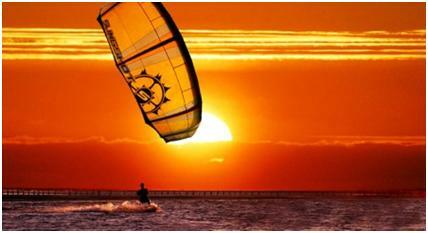 Kite surfing is a fusion of windsurfing, paragliding, surfing, and wakeboarding. A single experience of kite surfing will make you fall in love with this exhilarating sport. Kite surfing is an action-packed sport and the best place to enjoy it is Los Roques.┬á Los Roques offers great wind conditions throughout the year which makes it an ideal destination for kite surfing. The feeling of kite surfing above the dazzling blue-green waters of Los Roques is unforgettable. Los Roques draws both professional and amateur kite surfers the year round. All you need is a couple of lessons and youÔÇÖre all set to surf across the Caribbean. Cayo de Agua is considered to be the best spot for kite surfing in Los roques. This is due to its constant winds and flat crystalline waters. Cayo de Agua is a group of sandbars and cays which is protected by the reef barrier. Cayo de Agua is close to the largest island of the archipelago the Gran Roque. You can fly to Los Roques from Caracas and then take a boat from Gran Roque to get to Cayo de Agua. Cayo de Agua has a soft sand beach which is deserted most of the year. The water around Cayo de Agua is crystalline and the sea bottom is also sandy. Amateur kite surfers find this an ideal location as there are no safety hazards. You can also avail the facility of kite surfing schools available on the island. Free style kite surfers love the freedom offered by this beautiful island. Apart from kite surfing, you can also enjoy many other water sports on this beach such as scuba diving, windsurfing, and surfing. Some of the cays are off limit so take care not to stray to the restricted areas. The recorded wind strength of Cayo de Agua is 4bf to 5bf. The direction of the wind is usually offshore so there are no chances of you going in the wrong direction. The best time to visit Cayo de Agua are from March till June when the wind is around 4bf. The wind blows throughout the day so any time of the day is the best time to kite surf. The wind usually blows at an average of 16 knots to 25 knots every day.